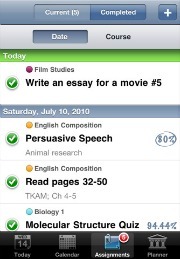 As a college student, iStudiez Pro is one of the most useful iPhone apps you can find. iStudiez Pro is an interactive calendar that integrates various "school related" activities. Features include timers and alerts for assignments and classes, a priority system, grade tracker and GPA calculator, and an in-depth daily/weekly planner. The interface is very pleasing to the eye and easy to get the hang of - an invaluable tool for such a low price. If you want a free alternative to iStudiez Pro, check out myHomework below. I love free applications (when they're not full of annoying ads), and this one comes in handy every once in a while. Cramberry allows you to create your own digital flash cards to study on, or pick from a variety of pre-made flashcards that other users have created. The design is very simple and easy to use. Cramberry will also monitor and record your performance throughout your flashcard review, and then present the more difficult cards more frequently throughout use. A free alternative to iStudiez. myHomework doesn't have as many features, nor is the interface as slick; however, it is still a better organizational tool than nothing at all. Like iStudiez Pro, myHomework is an interactive calendar complete with notifications for classes and homework. More involved processes like grade tracker, GPA calculator, priority system, and a few more features, will be missing as opposed to iStudiez Pro. Documents to Go allows you to create and edit Microsoft Office applications on your iPhone. ***UPDATE 12/22/2011*** - Documents to Go is no longer a recommended iPhone application. Reviews on the product have taken a major plunge as of recently and is falling behind in the race for integrative Microsoft Office applications. 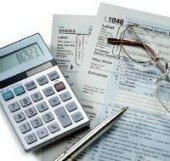 An alternative to Documents to Go is Quickoffice. I have not personally used, but reviews are generally good. I'll look into this more and list a replacement soon. One of the best reviewed iPhone apps on the market. 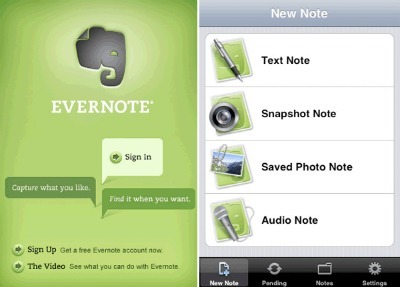 Evernote isn't just great for college use, users find many uses outside of class as well. Evernote allows you to create "notes" with text, video, and audio attributes. Class note-taking has been elevated to a whole new level with this application. On top of your regular text notes, add a few screenshots, a couple voice memos, or record an important part of your lecture. As more and more schools move to integrating Blackboard into their curriculum, this app is earning its usefulness. Blackboard Mobile Learn allows you to do most functions through the app that you would be able to do on your computer. The main issue that students have with the application however, is that it can only be used on a WiFi network - 3G/4G access is not currently supported. Genius Scan converts your pictures into PDF format (Adobe Reader). A recent comment made in the app store was by a student who took pictures of complex formulas off the whiteboard, then made PDF files for reference later. A friend of mine used to compile his notes along with mine for a biology class with Genius Scan, which worked out well for the both of us. Wolfram Alpha has quite a few uses to get you through math courses, especially with graphing assignments. The Wolfram Calculus Course Assistant iPhone application comes in handy as well. As with any kind of math software, there is plenty of room for error, and a difficult initial learning curve - but once you get the hang of it, this application might be invaluable to someone struggling with calculus. Dropbox allows you to store pictures, text, and video files on their cloud servers, for free...sorta. As to be expected, there is a limited amount of data you can store on their servers for free; however, anyone with a valid student email address (one that ends in .edu), gets 500MB extra storage for each person they invite to Dropbox. That's a ton of space. 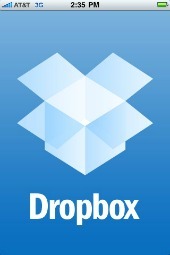 Dropbox has more or less the same functionality of a flash drive, without worrying about losing it. Calculator iPhone applications will not be able to completely replace a TI calculator, but this particular one comes pretty close. Free graphing calculator...the name says it all - is FREE. Check it out and you might be able to save yourself $80-$150 on something you only use for a semester or two.